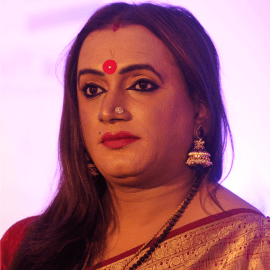 Laxmi Narayan Tripathi is a transgender rights activist, Hindi film actor and Bharatanatyam dancer in Mumbai, India. She was born in 1979 in Thane. She is the first transgender person to represent Asia Pacific in the UN in 2008. At the assembly, she spoke of the plight of sexual minorities. "People should be more human like. They should respect us as humans and consider our rights as transgenders," she said. Laxmi has served on the boards of several NGOs which conduct LGBT activist work. In 2002 she became president of the NGO DAI Welfare Society, the first registered and working organization for eunuchs in South Asia. In 2007 she started her own organization, Astitiva. This organization works to promote the welfare of sexual minorities, their support and development.